Do you have more than one Google (or Gmail) account? If so, you've undoubtedly encountered the hassle of juggling them in your browser. You have to sign out of one in order to sign into another, and on and on. Major pain. Well, no more--Google's new "multiple sign-in" feature lets you access multiple accounts simultaneously in one browser. 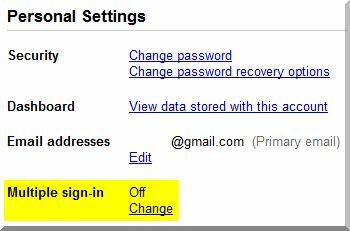 Currently, multiple sign-in works with Gmail, Google Calendar, Google Sites, Google Reader, Google Voice, App Engine and Google Code. When it's enabled, you'll see a drop-down next to your e-mail address at the top of the page. Two clicks and presto: you're switched to a different account.